An extremely powerful‚ high performance commercial front loading dishwasher with 2 wash arms and 2 wash pumps to ensure fabulous wash results. 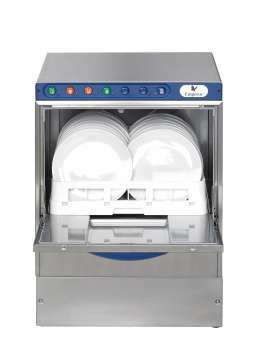 This superb model has the same power as the pass through system but loads at the front‚ it also has a larger door cavity and so has the ability to wash larger plates and trays. The wash cycle is variable from 1 – 4 minutes. This machine is ideal for outlets with heavy or constant throughput who have no room for a pass through dishwasher or prefer the front loading system. This superior‚ heavy duty dishwasher has a capacity of 18 full size plates per basket and is recommended for use in outlets with heavy‚ constant throughput. The 62P has 2 wash arms and 2 wash pumps to ensure an extremely powerful and effective wash. The pass through system can be operated in a straight line with tabling or in a corner layout and has the ability to wash larger plates and trays. The wash cycle is variable from 1 – 2 minutes.